WHEN I was a young boy, my siblings and I would anxiously wait for the long-anticipated rain. Upon the start of the downpour we would rush outside, romp in the rain and stomp on the welling puddles of water. It was a relief after enduring a hot weather. And so it was, with the installation of the new government. It was a time of exhilaration. As the rains would soften the parched lands after a long drought, it was a catharsis after a six-decade-long rule of the previous regime. After the fun and frolic, and amid the tapering rain, my siblings and I would sheepishly tip-toe indoors only to be confronted by our angry father, patently unamused by our antics. So it is, with the new government. As the honeymoon ends, and the exhilaration wears thin, the government has three fundamental issues to confront. FIRST , it has to confront the imperfect state of governance. SECOND , it has to display deft fiscal management to reduce public debt without compromising the budget-deficit-reduction trajectory and economic growth. THIRD , it has to restore public trust in government institutions. James Baldwin, an American novelist and social critic, once said: “Not everything that is faced can be changed, but nothing can be changed until it is faced.” The new government has demonstrated a profound awareness of the issues. It has sought to resolve them with alacrity. Institutions matter. Be they in the promotion of economic growth or good governance, institutions have strong transformational power to institute changes needed in society. That is why the government has unleashed institutional reform on a scale hitherto unseen, primarily, to weed out corruption and promote economic growth. Our corruption-index ranking had plunged from 36 in 2000 to a dismal 62 in 2017. A one-third improvement in the corruption index can cause a five per cent increase in investments in the economy and a half-percentage point spike in gross domestic product (GDP) growth. As part of the government’s reform agenda, new institutions have been created while existing ones have been reformed or abolished. The mammoth prime minister’s department has been clipped. Some of its agencies have been transferred to related ministries. Close to 30 departments have closed shop. Others have had their functions merged. 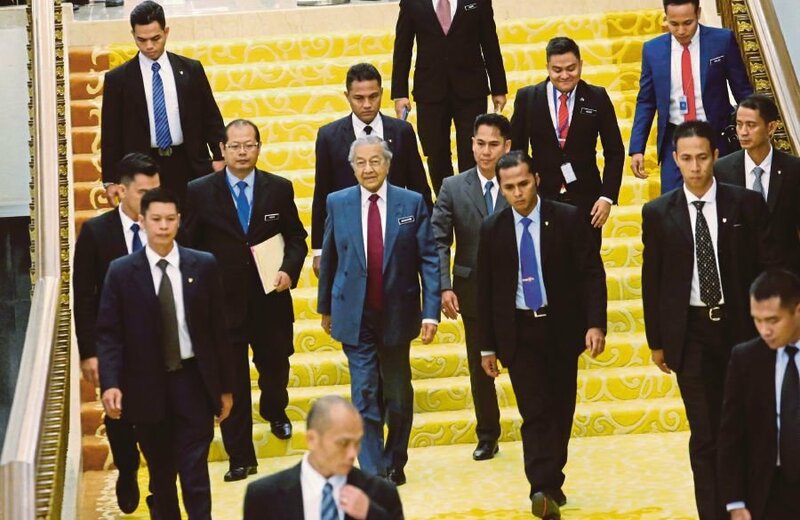 To ensure greater accountability to the people, nine agencies, including the Election Commission, Malaysian Anti-corruption Commission, Attorney-General’s Chambers, Auditor General’s Office and appointing commissions have been put under direct parliamentary supervision. Even Parliament will undergo reform through the revival of select committees to better scrutinise departmental expenditure. Obviously, the government is not short on ideas for institutional reform. Nonetheless, here are some suggestions. FIRST , the government needs to strengthen institutions that promote inter-faith tolerance and national unity. Unless the stirring of racial hate is eliminated, a true Malaysian identity cannot fully blossom. Bills on anti-discrimination, national harmony and reconciliation, and religious and racial hatred are to be tabled before Parliament. It is a commendable effort in the right direction. Upon becoming law, these should act as a bulwark against racial strife. SECOND , there is a need for an overarching framework within which the government can tackle its reform agenda. Such a plan will impart greater clarity to the government’s actions. It will also promote transparency and public debate on the best way forward. This transformation architecture will also inject greater investor confidence in our economy. More important, the reforms will seem less fragmented and more coordinated. THIRD , private agencies to whom public services have been sub-contracted should be reviewed. Such third-party agencies create an unnecessary bureaucracy. They are also a drain on public coffers as that revenue would have otherwise accrued to the government were the work done in-house. These intermediaries also charge higher fees. The deciding criterion for their continued retention is whether they add net value to the customers they serve. Fourth, public faith in government and its institutions should be revitalised. Public trust is sacred as it is the basis of a government’s legitimacy. As Ralph Waldo Emerson, an American poet, once said: “Our distrust is expensive.” Some of the public trust was redeemed upon the installation of the new government. However, there is a yawning gap between public perception of safety and statistics on crime-reduction. Enforcement agencies will have to reform if they are to be effective in dampening the escalating cost of living. We need institutions to be proactive in tackling issues of the future. For example, urbanisation will be an issue to contend with as 80 per cent of Malaysia becomes urban in 20 years. An ageing population has to be catered for as 15 per cent of Malaysians reach 60 years and beyond in 25 years. We are on the cusp of Industry 4.0. We need to be tech savvy and innovative if we want to retain our global competitiveness. Needless to mention, our education system has to be reformed, too, to ensure that it produces employable skills. There is power in momentum. It is akin to the waves that lap the shore. With each gentle swash, they push the tidal water-mark further ashore. As such, the government should push ahead with its reform agenda to move the government’s reputation to an even higher ground. To paraphrase the words of the American poet, Robert Frost, “we have miles to go before we sleep, miles to go before we sleep”.